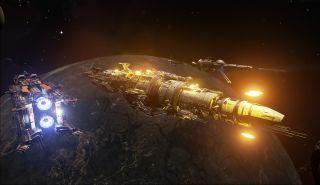 Fractured Space, the online giant space battle simulator being developed by the developers who did Strike Suit Zero, is playable for free this weekend on Steam. Even better, anyone who logs in during the free playtime will unlock permanent access to the Early Access game. Developer Edge Case is also offering in-game rewards to all players, based on the number of people that connect over the weekend. The first three—Captain Jingles, a skin pack, and a free ship—have already been unlocked, and it seems likely that the fourth, a free "premium" ship, will be easily achieved as well. "We’re now hastily convening to discuss ongoing rewards," the studio wrote in a blog post. "Rather than setting specific stretch goals we’d like to come up with some universal content to share with everyone, just to say a massive thank you." The free weekend begins at 2 pm EST on April 17, which means it will be live by the time you read this, and continues until 2 pm EST on April 20. During that time, the various upgrade packs will also be offered for 25 percent off their regular price.